Just days away from the inauguration of President Barack Obama, Capitol Affairs takes a look with the help of Jill Stein, former presidential candidate for the Green Party, at the state of politics, the state of the country and what the re-election of Obama means for the country. The entire interview will be aired on Monday, inauguration day, but here is the first part. 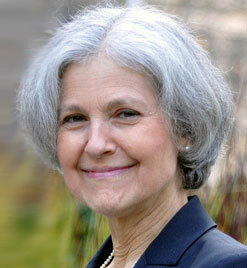 Dr. Jill Stein is a Doctor of Internal Medicine having obtained her degree from Harvard Medical School. She is the member of the Green Party and ran for a Governor of Massachusetts in 2002 and 2010. And she was the party’s nominee for President of the US in the 2012 election. Dr. Stein, thank you so much for joining us on the program. It is really good to be with you Carmen. Absolutely! My pleasure to have you. So, we are just right up on inauguration day for the President. Can you first of all talk a little bit about your reasons for running in 2012 against President Obama and of course the Republican nominee and other nominees that were in the race? Well, the reason I ran I think is really sort of the same reason for why I and so many others really continue to call out for real change and we hope to provide a real voice of opposition. We are going in the wrong direction and not simply going but actually accelerating in the wrong direction. And I was recruited to run and the specific reason that drew me in was because the President in the prior several months had gone on records supporting cuts to medic care and social security and medic aid as the answer to the debt ceiling crisis. This was back in 2011 and that was just clearly the wrong way to go. We’ve seen the President continue in that play. We’ve seen the rich get richer, we’ve seen trillions of our tax dollars be squandered and continue to be squandered on bailouts for Wall Street, tax breaks for the wealthy, wars for oil that we don’t need, massive wasteful expenditures on the private health insurance bureaucracy – this is where our scarce resources are going and they are instead delivering austerity for the American people. We are at the breaking point simply. And I think at this point they thinly veiled this breaking point, they have pretended to create a recovery, pretended to have taxed the rich and pretended to be protecting the social security and so on. But it is not so at all. The recovery for the Wall Street, recovery for the wealthy, the jobs that are protected are benefit poor jobs, we still have high unemployment. So, the problems continue, they are very thinly papered over crisis. We are in for more of the same. I think there is a big wake up moment that will be happening soon, especially as the austerity deals get locked in over the course of the next coming months with the upcoming negotiations. So, this is a good time for people to be rethinking their political allegiances and standing up for the real solutions that we could have right now. And this is what we tried to do during the election, to put on record that we don’t have to be losing it all, but we could actually be having it all right now with jobs with solving the climate crisis, bringing our troops home, ending these wars for oil. There is a win-win out there if and when we – the people – stand up and demand it. You know, I think it is fascinating actually that you’ve mentioned one of the reasons and the number one reason that you decided to run was because of what you called… well, actually let me call it, because you didn’t use this word, but I want to. These foul arguments over the debt ceiling, it is exactly what is in the news again right now, I mean the situation is almost identical, it is déjà vu all over again. Exactly! I just had published on other words sort of alternatives indicated column on the web under that url – other words – making exactly that point that this is déjà vu. This is political déjà vu, it is like the first time Obama was elected. We had a supposedly progressive candidate running on hope and change. And what was the first thing he did? It was to appoint Larry Summers, the architect, the engineer really of waste, fraud and abuse on Wall Street. He was then appointed, as one of Barack Obama’s first appointments, he was appointed to head basically the economic advisors. And then Timothy Geithner who managed to look the other way, Wall Street actually practiced that waste, fraud and abuse was brought in to head Treasury ensuring that that waste, fraud and abuse would be the official policy in the White House. And so there was a wake up after the first election that this indeed was the best friend of Wall Street that we had elected, not actually this populist candidate that he’d pretended to be. And all sorts of progressive policies continued to be rolled out, including massive bailouts for Wall Street, neglect of the free trade agreements that continued to send our jobs overseas, more wars for oil, bailouts for the banks while home owners and students went into deeper and deeper debts creating among others an entire generation debtors. And finally I have to mention the climate crisis too. It continues to escalate and Obama basically embraced the policies of George Bush and went far beyond in all of those areas just mentioned and in addition on our civil liberties which have been further under assault under the Obama administration, with everything from the criminalization of protest under H.R. 347 to the indefinite attentions under the NDAA which was just renewed this past New Year’s Eve or approximately, and the rights of assassination and expansion of the drone wars. And here we are now about to go into Mali which is a war over uranium resources to maintain nuclear power. So, after the first election we had a very rude awakening about who this President really was. During the last campaign we saw him revert to once again progressive candidate who promised he would make the economy fair. You know, there were accolades in the progressive community because the President had sounded his voice and mission once again, populist Obama was back just in time for the election also promising to protect social security and tax the rich. But within weeks after the election, before he is even been inaugurated suddenly he’s managed to give away that store on tax reforms. So, he basically put an end to a state tax, to lucky and to low capital gains rates and to just provide the least little fig leaf of attack on the wealthy families as he had promised which was embarrassingly pathetically small and inadequate to start with. You know, suddenly real Obama is back. He hasn’t even been inaugurated, that ink of the elections and all the promises made has hardly even dried and suddenly it is the same old song. So, yes, it is déjà vu all over again, same old flip flop from the progressive candidate to the unapologetic Wall Street ally in the White House. You’ve brought up so many different subjects and I actually want to try to get to as many of them as we can a little bit more in depth if we could. Let’s go ahead and start with the last one, you talked a little bit about taxes. The argument has been made of course that the President isn’t a totalitarian, he can’t just decide what the tax rate should be and he had to deal with the politics of Washington at that time and simply couldn’t get more in terms of raising taxes particularly on the wealthier in this country. Is that not a good argument, just simply the fact that he has to work within the framework of Washington? Well, he could have at least tried. And he had an enormous and powerful bargaining chip which was the expiring Bush tax cuts. He could have held out and actually use those tax cuts to have protected medic care and social security for example in locking in on those tax cuts. And he basically locked in some 98% of those tax cuts, all except very small tax increases on the very highest levels of wealth a gave away all sorts of other stuff in addition including essentially repealing the state tax so that we now not only have unprecedented disparities in wealth in this country, they are now inheritable, like it haven’t been certainly in the last centuries, since the state tax has been around. And it was widely supported by both the Democrats and Republicans that we should not have an inherited aristocracy in this country, yet that’s what we are back to now. You know, we really saw the President throwing the towel here before there was even a tug of war with that. And that’s not what we deserve, that’s not what the American people bargain for. We could have at least had someone going there fighting. And he really went in there with that concession at the outset. Even John Boehner had offered much more, a much greater tax concessions and revenue concessions than the President even fought for. And in the end a marginal tax increase on like the top 1% of the country which is a little bit ironic when you consider the mantra of the Occupy Movement that we’ve seen over the last couple of years which was – we are the 99%. So, when you consider the fact that only the top 1% of the earners in this country saw a slight tax increase, why aren’t the other 99% really upset? What’s not bringing them out again? You know, in part I think this kind of happened over the holidays and was suddenly revealed on New Year’s Day. And that didn’t happen by accident, you can be sure. That’s they do these horrible betrayals at a time when people aren’t paying attention. It has been very quickly which was “hands up”, which in itself, when they are rushing things through under the cover of winter holidays, you can be sure it is not good stuff. And it is only now coming to light. And I think the corporate press certainly implicated here. They do their best to keep it quiet for their big corporate sponsors. You know, the media is incredibly consolidated, more than ever. And thanks to true independent media like you the story gets to be told, but it is definitely around the margins. So, most people are absolutely clueless. But I think this is one of the real problems of the Obama administration that there is such a propaganda campaign now surrounding this President and the Democratic Party which pretends to be a voice of by and for the people that a lot of progressives are left with this incredible cognitive dissonance and they get silenced in the confusion surrounding it. This is why I think it is so important that we, who do understand what is going on, that we stand up and that we not be goated into this politics of fear which tells us to be quiet and protect the lesser evil because there could have been a greater evil sitting in that office. The reality is – those small differences between the lesser and the greater evil, those small differences are around the margins. Yes, they are differences but they are not enough to save your job, to save wages, to save your social security, to save your climate, to save your planet, to save your life. We are very much in the target here. We have a false economic recovery going on. We are as much at risk as ever for another economic meltdown, bigger than ever that we cannot bail ourselves out. And God knows, they are continuing this $80 billion bailout every month that the Fed is doing now for the big banks yet again. And what have we gotten for it? Nothing. So, we continue to titter on the brink of economically, we are accelerating towards the brink in terms of the climate. We’ve just been through a devastating year but it is only a hint of what is to come and we are catapulting faster than ever towards that climate crisis from which there will be no recovery. It is clear, it is not ok to sit back and let politics as usual, whether it is a democrat or a republican, continue to take us over the cliff. It is really important for those to see clearly what is going on, to stand up and cast off this politics of fear and trade it in for the politics of courage because it is now or never if we are going to stand up. It is not just future generations, it is our kids, it is ourselves who are in the target here right now. That was part of our conversation with Jill Stein – Green Party activist and Green Party nominee for president in the 2012 race. The entire interview will air on Monday, inauguration day, at 5 pm eastern time on the American Edition of Voice of Russia. 1 Comment on "‘US accelerating in wrong direction’ – Jill Stein in exclusive interview"
WHO or WHAT IS THE ” VOICE OF RUSSIA” ?WOULDN’T THIS TITLE BE DETRIMENTAL TO JILL STEIN’S AGENDA? AN INTERESTED GREEN PARTY POSSIBLE.